• Throughout 2016 the industrial & logistics stock in Romania increased by 20% and reached 2.5 million sq. m. Bucharest remains the largest market. Outside Bucharest, the vast majority of the existing supply is divided between five regional markets: Timisoara, Ploiesti, Cluj, Brasov and Pitesti. • In 2016 more than 370,000 sq. m of industrial & logistics spaces were completed. This represents the highest level recorded so far in Romania. • Last year net take-up reached record heights, confirming that within the CEE region Romania is a viable location for industrial & logistics occupiers. 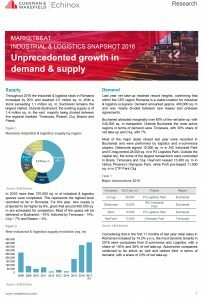 • Given the economic growth based on private consumption and investments, demand for industrial & logistics spaces in Romania is set to follow the same uptrend. Retail & E-commerce and Logistics & Distribution companies will continue to look for options in their quest to accomodate operations.